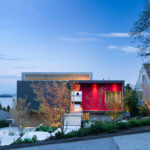 RUFproject have recently completed the unique and modern renovation of an early 1900’s character house in Vancouver, Canada. 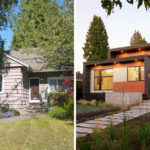 Poorly executed renovations over the years, a constricted plan, and an all but ignored view to the north, drove a full rethink of the house. 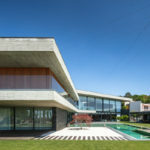 The designers stripped it back to its original form, updated it for current living standards, and opened up the north facade to the panoramic views. 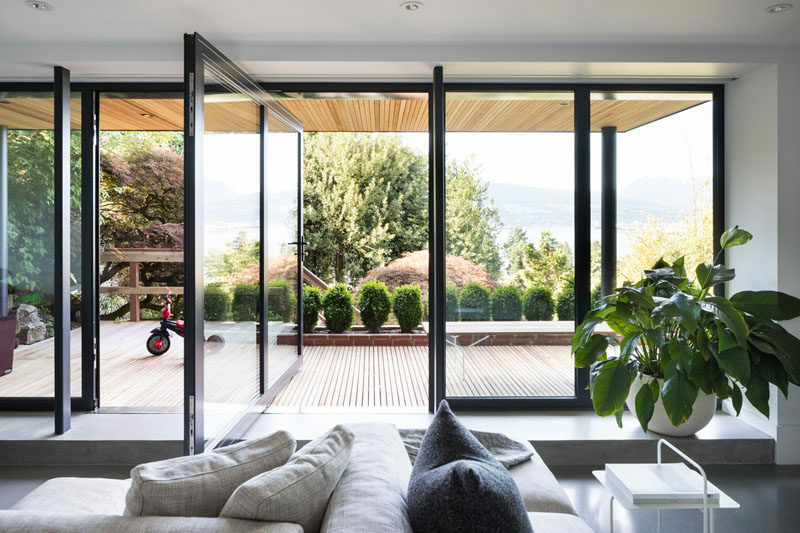 Located on the lowest level of the home, is a family room that has a large glass pivot door to create a direct connection to the outdoor garden. 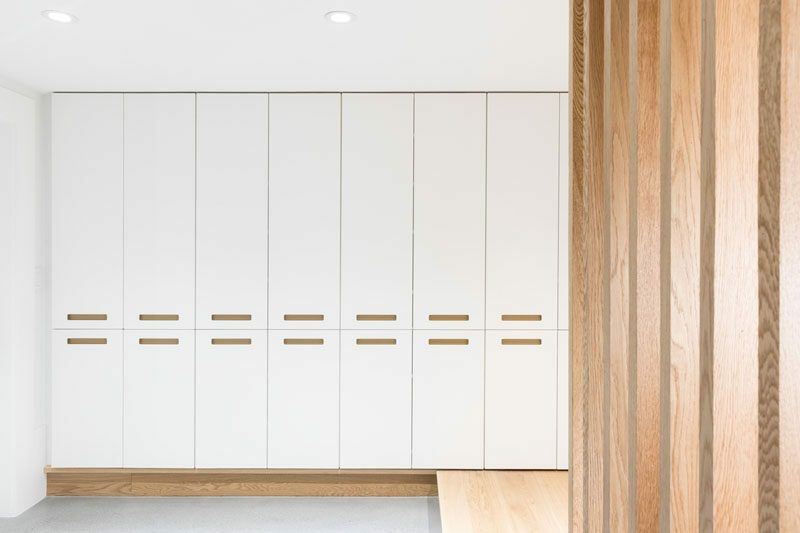 Also on this level of the home is a storage area with tall white cabinets. 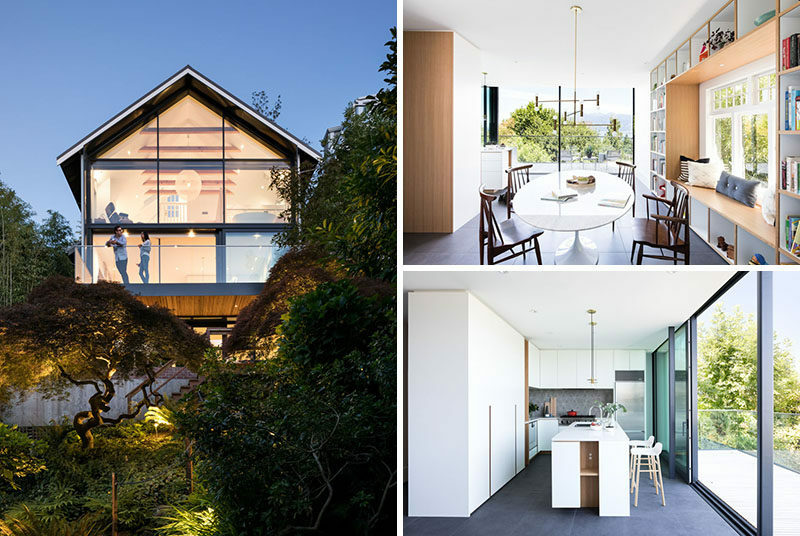 On the middle floor of the home, there’s a dining area with a built-in window seat. 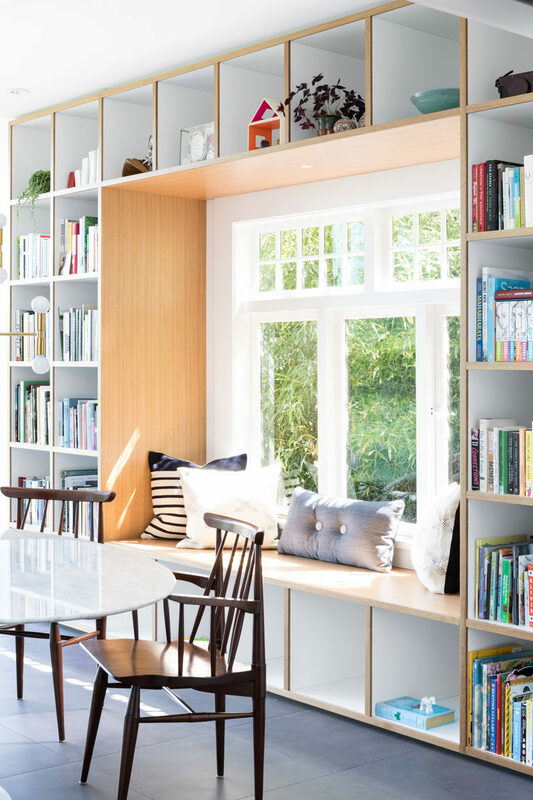 The wood framed built-in window seat is surrounded by open shelving, creating places to store books, decorative items, and toys. Around the corner from the dining room is the kitchen. White cabinetry lines the walls, while a long kitchen island provides a place for food prep and the overhang allows for some seating. The dining and kitchen areas both open up to a balcony with a glass railing. Back inside, and there’s a staircase that leads to the upper floor of the home. 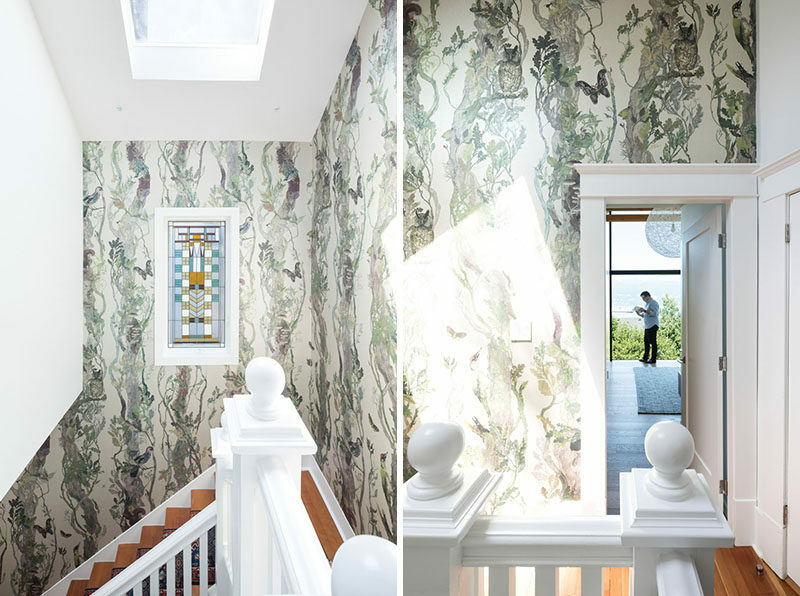 The walls are covered in a botanical patterned wallpaper, while a skylight provides ample natural light. In the master bedroom suite, there’s a vaulted ceiling with exposed wood beams. 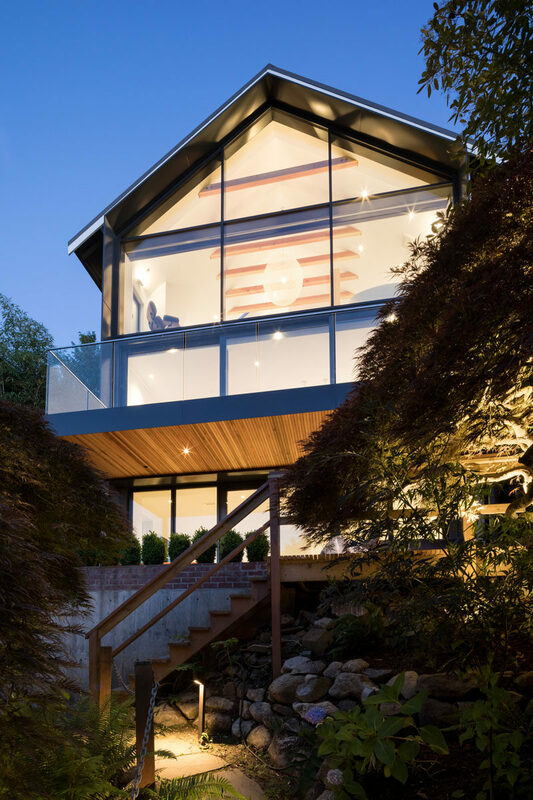 A wall of windows helps to create a bright and open interior, while a fireplace adds warmth on a cold night. Somewhat hidden behind a wall in the master suite is the bathroom. 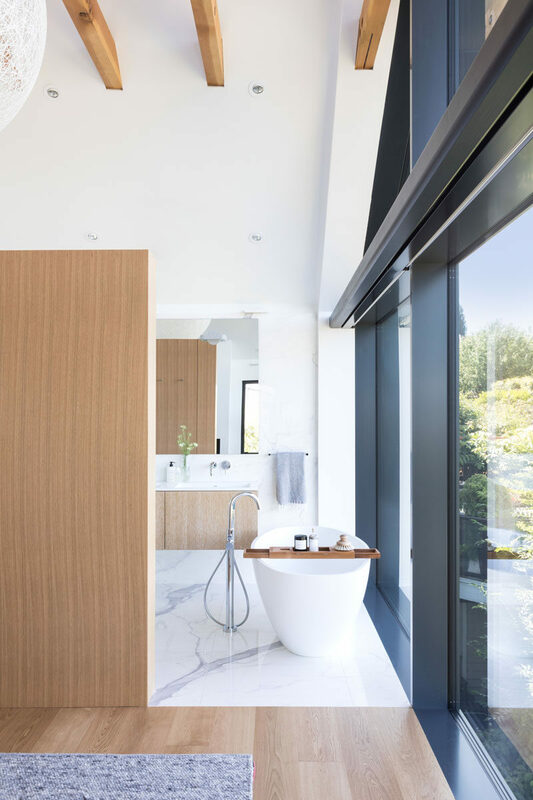 A freestanding white bathtub is positioned in front of the windows to take advantage of the views, while further behind the wall is the vanity area, toilet and a walk-in shower.